Meet Maureen, Teresa and Karen, The Ennis Sisters, from Newfoundland. 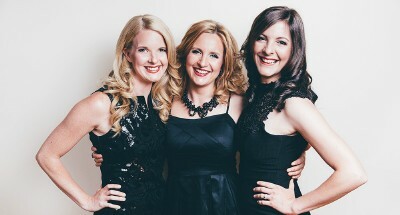 The Sister’s just received 3 ECMA 2002 nominations for: Group-Entertainer and Pop Group of the Year. This is quite an accomplishment for a group who have been performing since early childhood, and released their first independent CD entitled, Red Is The Rose, in 1997. This CD was named Folk Album of The Year at The Newfoundland & Labrador Music Industry Awards. A year later, they won Group of The Year and Female Artists of the Year. Two years later they received the award for Album of the year entitled, 3. Those recordings earned the girls national recognition with MacLean’s Magazine who included them as one of the top 100 Canadians to watch and YTV chose the girls as top five finalists in YTV’s 1999 Young Achievers Awards. In February 2001, they signed their first record deal with Warner Music. The group signed on with manager Andre Bourgeois in 2000, who had already been instrumental in building the international success of Natalie MacMaster. Their second CD entitled, Christmas On Ennis Road, led to a CBC Christmas TV Special, and the album was released on the heels of their performances in the Celtic musical Needfire in Toronto in 1998. With their success thus far, they have been touring throughout North America, and appeared in several prestigious Music Festivals, including, The Stan Rogers Folk Festival, The Montreal Celtic Festival, the Winnipeg Folk Festival and Merlefest in North Carolina, USA. They have just released their first CD with Warner Music, entitled “Ennis Sisters”. The CD contains 11 songs, all written by Maureen. The Ennis Sisters at the moment are on a CD promotional tour in Canada and will end their tour in St. John, New Brunswick at the ECMA awards, Jan. 31-Feb. 3/02. Now in November, 2015 they begin their Annual Christmas Tour which begins on November 21 and taking them to Ontario, Alberta, Saskatchewan and ends in St. John's, NL on December 22. Click on their appearance schedule above to find Venue dates.